Find out the results of TODAY's sneak preview Snickers taste test. When a new batch of candy arrives at TODAY's office, it often disappears in minutes. Friday was no exception when Snickers sent over three brand new flavors for the team to try for an early taste test. On Monday, Snickers announced the launch of the three new flavors: Creamy Peanut Butter, Creamy Almond Butter and Creamy Almond Maple Butter. The word "creamy" is important here because it means none of the bars are filled with the brand's signature whole peanuts of the original bar or the more recent addition of crispy rice. "They've been replaced with freshly ground, creamy nut butters," a spokesperson told TODAY Food. The bars won't be available until January 2019, but when they launch, they'll be available in three different sizes: 1.4, 2.8 and 7.7 ounces. Here's how each new candy bar fared in TODAY's taste test. This flavor caused the biggest divide between tasters. Yes, there are already two Snickers with peanut butter, but this one doesn't have any chopped up peanuts or crispy rice like the others. Sounds like a bummer at first, but some of the tasters said that was just fine by them. That's because the bar reminded them of another beloved candy: a Reese's Peanut Butter Cup — but with "the signature chewy texture of a Snickers," one taster said. "If you're a fan of peanut butter cups, the peanut butter Snickers is a delightful treat," said another. Others were put off by the texture of the filling. "The peanut butter doesn't seem really smooth and even though I'm not huge a peanut fan I miss the nuts!" another taster said. "This seems like the grittiest bar of the bunch to me." Although tasters found that the almond butter flavor was "pretty legit," almost every taster remarked that something was not quite right with the texture. "I'm not totally mad about this one because it's not super, super sweet and the almond flavor is pretty legit but the texture reminds me of one those whey-filled protein bars — super grainy, gritty and overall just not a great mouthfeel," one taster said. Two other tasters likened the texture to a protein bar. "It's trying to be healthy, but it's not quite," another taster said. Although several noted that this bar was "sweeter than your typical Snickers bar," everyone agreed that the flavor was "the most original" and "seemed fancier than something you'd find at the drugstore checkout." "It reminds me vaguely of those Canadian maple leaf candies, which I absolutely love but don't get to eat very often, so even though it's super sweet, this seems like the most unique," said one taster. The almond butter flavor caught the most flack for its texture and the peanut butter version was well liked by most, but the maple almond butter bar was the hands-down favorite flavor according to many TODAY editors. "When I think of a Snickers, I expect creamy caramel and different textures, which these bars just don't really have," one taster said. 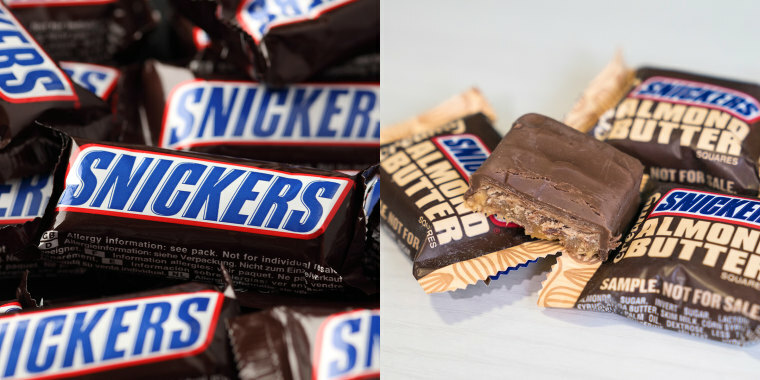 Many tasters note that they missed the "crunch of the peanuts from your classic Snickers bar," although they'd likely still buy the maple almond butter and peanut butter flavors.